Here in the UK, we’ve been experiencing an Indian summer. Blue skies, sunshine, warmth, walking around in short sleeves… I’ve been enjoying it for sure. And so has the garden. 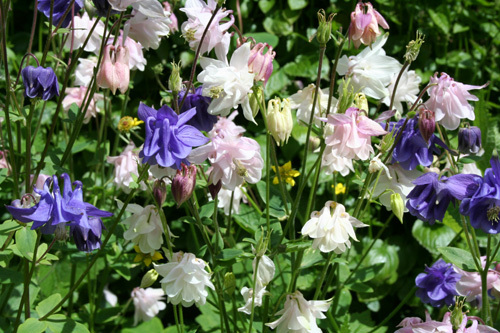 Typically winding down for Winter this month, gardens have suddenly burst into colour again. 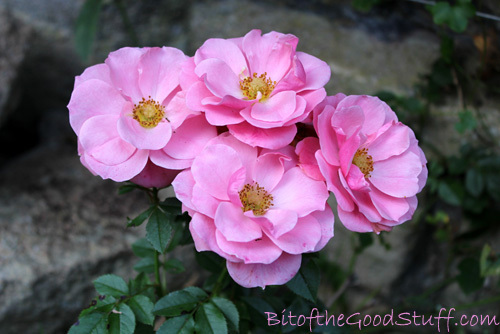 June roses are back in full bloom. I’ve never known this happen before. I’ve been dreaming about Florentines ever since I saw them on display in the patisserie shops of Venice and Florence a few years ago. I’d never seen anything quite like them before. They looked so dainty yet totally decadent with their dark chocolate bottoms! I was pretty sure that they’d be full of dairy and off limits to me, but I was excited about the thought of creating a vegan version one day. This week I finally got round to a little Florentine experimentation in the kitchen. 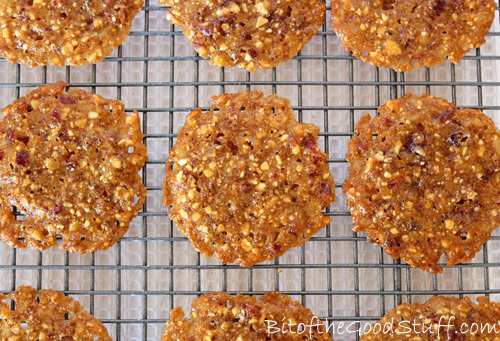 The cane sugar and honey was swapped for coconut sugar and maple syrup, which gave the Florentines a wonderful golden hue and caramel-like sweetness. Instead of candied cherries and citrus peel, I used dried cranberries and orange zest. This gave the Florentines a fresh, citrussy flavour which I absolutely loved. The butter was exchanged for non dairy spread or organic aroma-free coconut butter. I’ve done 6 trials so far this week, playing around with different ingredient ratios and combos. All have tasted delicious, but I was striving to bake a Florentine that was super thin with the traditional ‘lacey’ texture on the underside. By the 4th trial, I’d cracked it. Once cooled, I then added the classic Florentine wavy chocolate bottom. 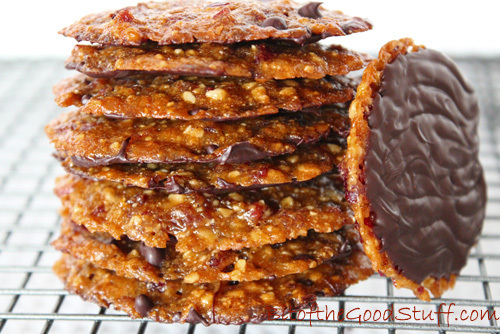 These Florentines are my new treat obsession. I absolutely love their texture – crisp on the outside, chewy in the centre with a melt-in-your-mouth chocolate bottom. Plus the flavour combination is so lush. The citrus zest gives them a wonderful lift while the dark chocolate makes them feel decadent. ‘M’ and Lil’ L seem to love them as much as me. I’ve made 72 so far this week, and there are very few left in the biscuit tin! I also took along a sample to my Tuesday night study class and they were a big hit! If possible, I recommend weighing the ingredients rather than using tablespoons as it’s more precise. I find that the shape and ‘lacieness’ of the Florentines varies depending on the size of the fruit and nut pieces, and the type of flour or fat used. Regardless of their shape, all are totally delicious! Preheat the oven to 180C (160C fan) / 350F. Line two large baking sheets with non stick baking paper. Place the almonds in a frying pan (skillet) and dry fry for a few minutes, stirring regularly. As soon as they start to brown and become fragrant, tip them onto a plate and leave to cool. Once cool, finely chop the nuts or scrunch them in your hands to break them up. Finely chop the cranberries. Zest the orange. In a small pan, gently heat the non dairy spread / coconut butter. Once it has melted, whisk in the sugar and syrup. Remove from the heat and whisk in the flour until fully incorporated. Stir in the nuts and fruits. 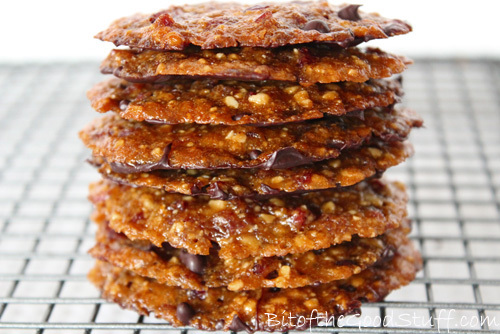 You want to get the mixture as uniform as possible so that the Florentines spread evenly as they bake. Drop six rounded teaspoons of mixture onto one baking sheet. Be sure to space them out well to give them room to spread. Add another six teaspoons to the second baking sheet. Using damp fingers, press down on the Florentines to flatten slightly and shape into circles. 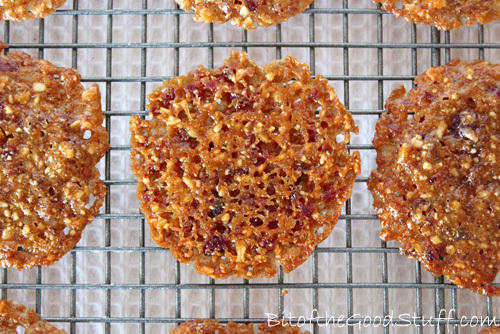 Place in the pre-heated oven and bake for 8 minutes, or until the edges of the Florentines have browned. Leave to cool. (They will be very soft when they come out the oven, but they firm up as they cool). 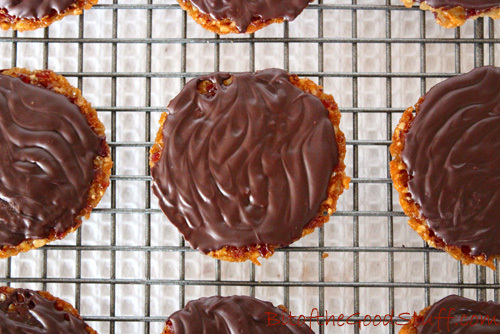 Once the Florentines are completely cool, prepare the chocolate coating. Place the chocolate pieces in a heat proof bowl set over a pan with an inch or so of water (make sure the water doesn’t touch the base of the bowl). Gently heat the water and stir the chocolate until it has fully melted. Remove from the heat. If the chocolate is very runny, keep stirring it until it has thickened slightly. Using a knife, coat the bottom of each Florentine with chocolate, then wiggle a fork along the chocolate to form a wavy pattern. Leave the chocolate to set. The Florentines will keep for a week or so in an airtight container. In warm houses, it’s best to store them in the fridge. They also freeze really well so it’s worth making a double batch and freezing some. That way, you’ll have a stash ready for coffee mornings, surprise visitors or whenever a sweet craving strikes. You’ll find Suma products available to purchase in UK independent health food shops. You can also bulk buy many of their products from Amazon. The recipes I most often share are firm family favourites that I’ve been refining over a number of years. So when I get inspired to create a new recipe that I want to blog now rather than in 5 years time, I end up obsessively testing it again and again over the course of a week or so to play catch up with the tweaks and refinements. 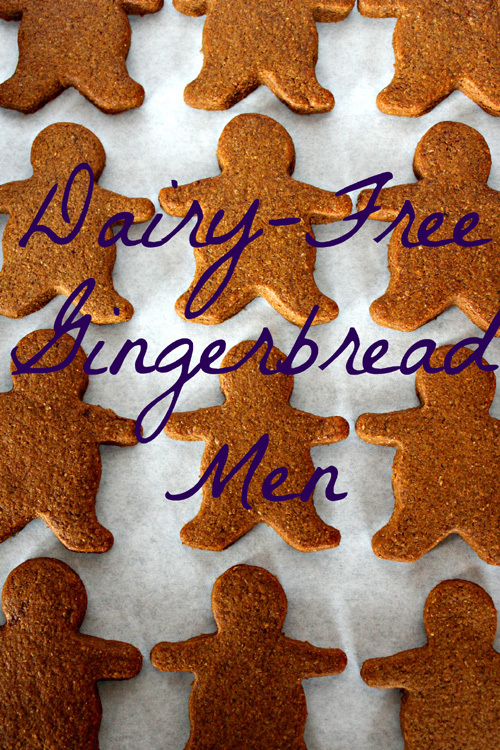 When Amy mentioned gingerbread under my waffles post, it reminded me that I hadn’t made gingerbread men in years. I decided it was high time I dusted off my old recipe notes and gave them another whirl. So far this week, I’ve made 72 gingerbread men! Family and friends have kindly been helping me out with the testing. Lil’ L’s taken them to school, Mark’s taken them to work, and I’ve shared them with friends over coffee (not the classiest of cookies but hey it made them smile). All the batches got great feedback, but Mark thought they could be a bit ‘gingerier’ so the next batch had an extra ½ tsp of ginger. I’ve tested different thicknesses (the thicker men were the winners), different sugars and different oils/butters. All worked fine, so I’m guessing the recipe is pretty adaptable. I also tested different cooking times and I personally preferred the longer time as it made them firmer and crunchier round the edges. 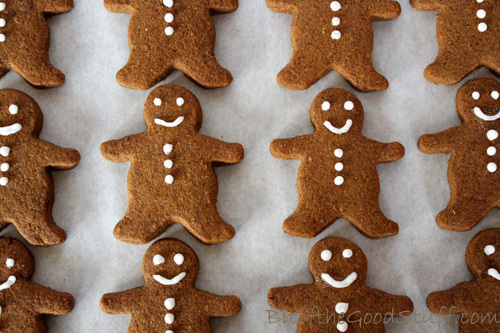 Readers have also had great success using gluten-free flour to make these gingerbread men. Check out the Comments section below to see their feedback. Place the oil/spread/butter in a pan with the sugar, molasses and milk. Gently heat over a low heat. As it warms, whisk to combine. Sift the flour, bicarbonate of soda, salt, ginger, cinnamon and nutmeg into a large bowl. Give it a mix to make sure it is combined. Pour in the contents of the pan and stir until it comes together to form a dough. This will take some elbow grease as it’s a stiff dough. (If you’re using coconut butter, you may need to add 1-2 TBSP more milk to form a smooth non crumbly dough). Shape the dough into a ball, wrap in clingfilm (plastic wrap) and chill for 1 hour. The dough can be chilled for up to 2 days but, if left for more than 1 hour, remove from the refrigerator 10 minutes before rolling. When ready to bake, preheat the oven to 180C (160C fan) / 350 F. Line 2 large baking sheets with non-stick baking paper. Place the dough on a silicone mat or lightly floured work surface. Place a sheet of non stick baking paper on top and roll to a thickness of ½ cm (just under ¼ inch). 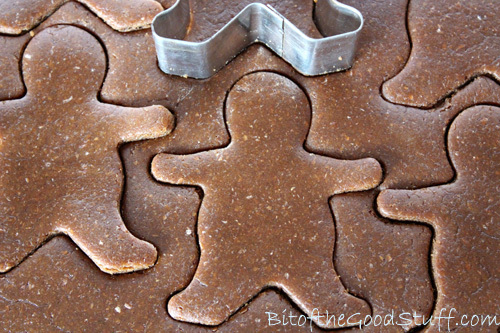 Press out the dough using a metal cookie cutter and transfer to the prepared baking sheet. Combine the dough scraps into a ball and roll out again. Repeat until all the dough is used. Place in the oven and bake for 10-14 minutes. (I check mine after 10 minutes and then bake for another 2-4 minutes as I like mine firmer and crunchier). Leave to cool and firm up for a few minutes, then transfer to a wire rack to completely cool. The cookies will last about a week in an airtight container, or for weeks in the freezer. If freezing, place in a single layer in a freezer bag. Press out all the air before tying or zip locking. 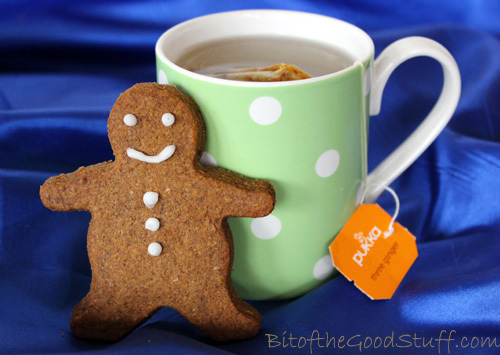 Freshly baked, these gingerbread men are crispy round the edges with a soft centre. Over time, they become softer and chewier, but delicious nonetheless. If you try the recipe and make any adjustments, do let me know. I always love to hear your feedback! I also had a special six year old in mind when I made the switch. Like me, he has a dairy allergy, but he’s also allergic to nuts and seeds. I’ve been posting lots of recipes with nuts lately, so it’s high time I redressed the balance. 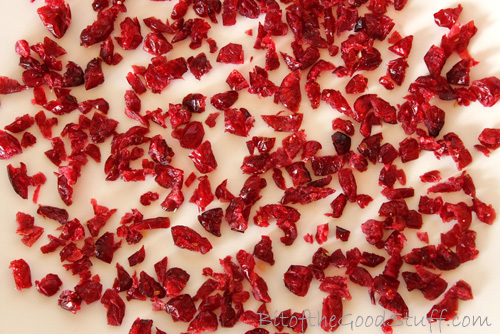 This time of year, I love using dried cranberries in my baking. 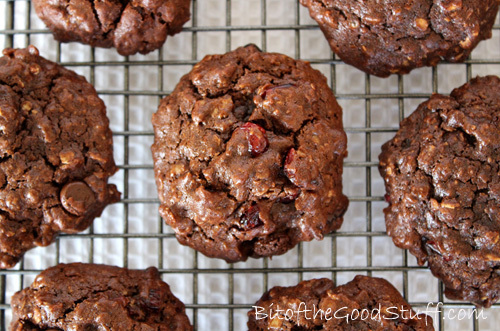 In cookies, they glisten like little rubies, especially when set against a backdrop of dark chocolate. 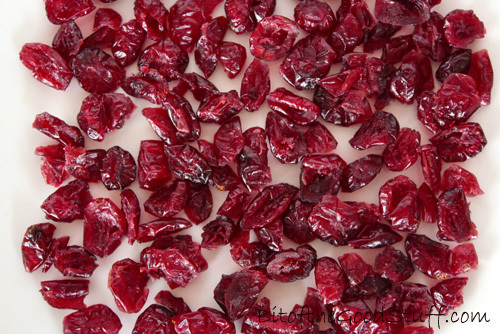 Until recently, I found it difficult to find dried cranberries that weren’t laden with cane sugar. However, I’m really pleased to see that the supermarkets like Tesco and Waitrose are now stocking cranberries sweetened with pineapple juice in their wholefood sections. To me, they taste far nicer than the sugar coated fruits. 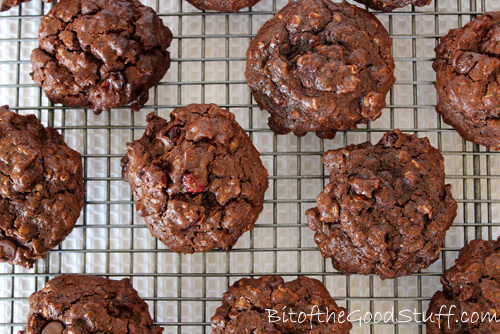 These double choc chip cookies taste pretty decadent, but they contain lots of good stuff. The wholegrain flour and oats provide protein, fibre and slow release energy, while the cocoa and cranberries add antioxidants, vitamins and minerals. Freshly baked, the cookies have a crisp outer shell and warm, fluffy interior. They firm up in time, but are equally delicious. The cookies freeze really well too. I often freeze half of the batch so I’ve got a ready supply for lunchbox treats, afterschool snacks and coffees mornings with the girls. These cookies have been a big hit with friends and family. I hope you enjoy them as much as we do. Preheat the oven to 180C (160C fan) / 350F / Gas 4. Line two large baking sheets with non stick baking paper. Sift the flour, cocoa powder, baking powder, bicarbonate of soda and salt into a large bowl. Add the oats and stir to combine. In a separate bowl, whisk together the milk, oil, vanilla extract and sugar until smooth and fully combined. Mix the wet and dry ingredients together. Stir in the choc chips and cranberries. Scoop heaped tablespoons of dough onto the prepared baking sheet. Lightly press the tops to flatten slightly. Bake for 15 minutes, or until the top of the cookie is dry to touch. Leave the cookies to cool (they will firm up as they cool) then transfer to a wire rack. When completely cooled, store in an airtight container where they will keep for up to a week. These cookies also freeze well. 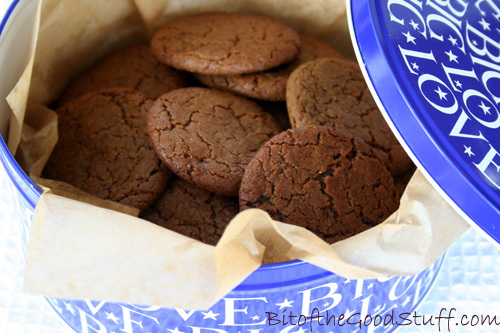 Stored in a bag or container with greaseproof paper between each layer, the cookies should keep for weeks. I just need to work out how to gluten free these cookies now, and we can all tuck in. If any GF vegan bakers can share their wisdom, it would be very much appreciated! Today, I am delighted to share my first post for the Suma Blogger’s Network ♥ I’m sure a lot of you will have already heard of Suma or seen their products in your local health food stores. Suma are the UK’s largest independent wholefood wholesalers of vegetarian, vegan, fair trade, natural and organic produce. Suma operates as a workers’ cooperative which means that the business is jointly owned and managed by the staff. Everyone is paid the same and they collectively do all the jobs that need doing, whatever they happen to be. Every other month we’ll be sharing a recipe using one or more products from Suma’s product range. We’ll post the recipes on our blogs, and share them via Facebook, Twitter and a dedicated Pinterest board. This month, I’m sharing a recipe using one of my all-time favourite ingredients and ‘super’ foods…. Blackstrap Molasses! As you might know, Blackstrap is the dark, thick liquid that remains after sugar cane is processed to make refined sugar. 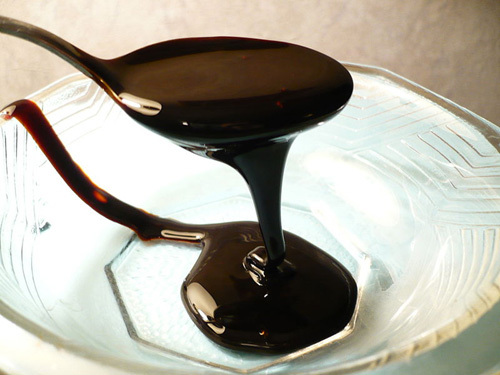 While the end product – white sugar – has no nutritional value whatsoever, the molasses that gets left behind after extraction is literally brimming with nutrients. It’s rich in vitamin B6 and minerals, including calcium, iron, magnesium, potassium, manganese and selenium. Historically, this byproduct of sugar production has been used to feed livestock, while humans consume the empty calorie, unhealthy white sugar. Crazy eh? Flavour-wise, Blackstrap is rich and bittersweet. To me, it has a liquorice-like flavour which, I guess, is one of those flavours that you either love or hate. If you have Blackstrap lurking at the back of your cupboard, then this recipe might just tempt you to dust off the jar and give it another try. 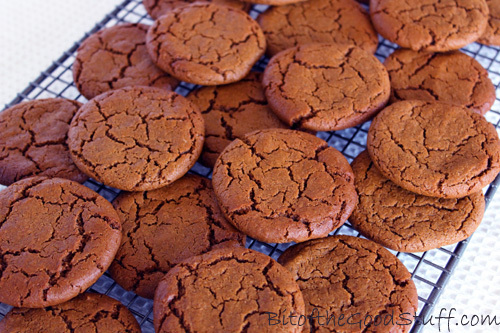 The Blackstrap adds a wonderful depth of flavour and colour to these ginger cookies, but it’s not overpowering at all. For the dry sweetener, you can use unrefined caster sugar or coconut sugar. I prefer the latter as it’s low GI (which helps to keep blood sugar levels balanced), plus it contains B vitamins and a range of minerals, including potassium, magnesium, zinc and iron. I also love its caramel-like flavour. Feel free though to choose whatever sweetener suits your personal tastes and preferences. I prefer the coconut sugar cookies, ‘M’ prefers the cane sugar ones (which are slightly sweeter), and Lil’ L says he can’t really tell the difference and loves both! 1. Preheat the oven to 200C (180C fan) / 400F. Line two baking sheets with non stick baking paper. 2. Place the sugar, oil, molasses, milk and vanilla extract in a bowl and whisk with a fork until smooth and fully combined. 3. Place the flour, spices, baking powder, bicarbonate of soda and salt in a separate bowl and stir through. Tip half the dry ingredients into the wet ingredient bowl and stir to combine. Add the remaining dry ingredients and keep stirring until the mixture comes together in a firm dough. 4. Scoop slightly rounded tablespoons of dough and arrange six on each baking sheet. With damp hands, press the dough into a thin cookie shape. 5. Bake in the centre of the oven for 9 minutes, or until dry to the touch. (The cookies will still feel soft, but they firm up as they cool). 6. Leave the cookies on the baking sheets until they are firm, then use a thin spatula/slotted turner to remove them from the baking paper and transfer to a wire rack. 7. When completely cool, store in an airtight container where they will keep for a couple of weeks. They also freeze well. Leave at room temperature for about 10 minutes before serving. 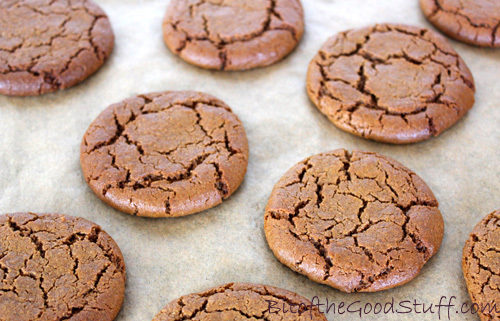 Freshly baked, the cookies should be lightly crisp on the outside with a soft, chewy centre. They go softer and chewier over time, but are just as delicious! 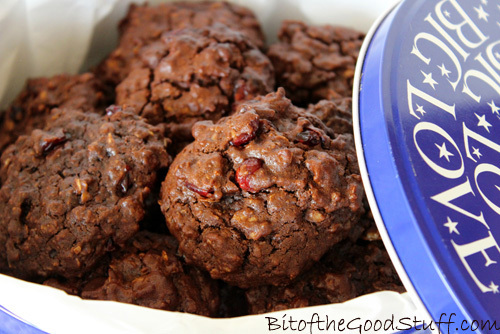 If you have any black treacle (aka molasses) leftover from Christmas cakes and puddings, you can use it in these cookies instead of the Blackstrap. All TBSP mentioned in the recipe are level tablespoons. 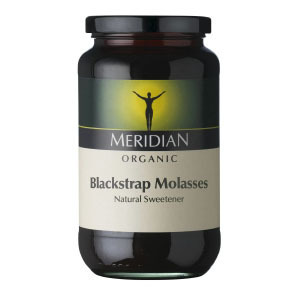 Are you a fan of Blackstrap molasses? If so, what’s your favourite way to use it? Disclaimer: I received some Suma’s products to use for recipe development but, as always, all opinions expressed are my own. 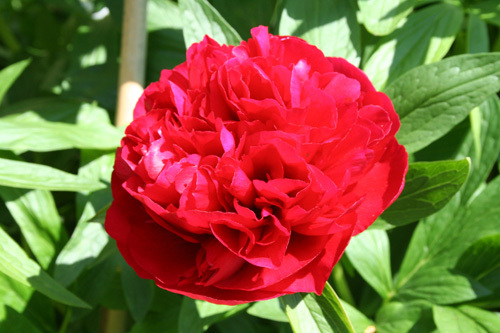 and the peonies have started to bloom. 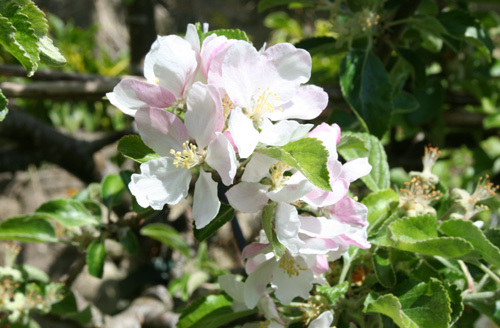 We had zero fruit on the apple and plum trees last year due to the poor weather conditions, but things are looking better this year. 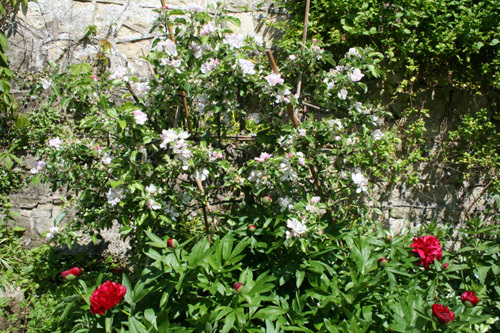 Even the tiny apple tree growing in our rockery is covered in blossom. 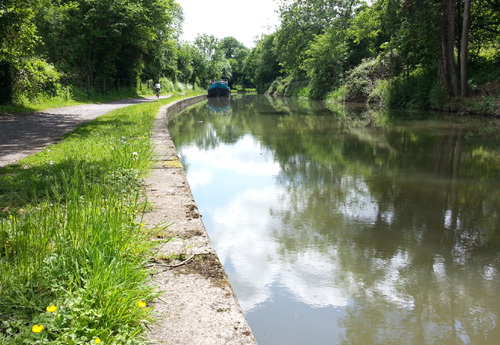 The weather is still very patchy at the moment though. 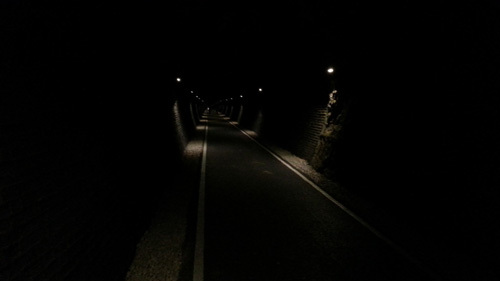 One day we have glorious sunshine and it’s warm, while the next day it can be cold and dark, with non stop rain. I don’t know when (or if) the weather is going to settle down this year, so we’re just going to have to make the most of the sunshine when it appears. This morning, before heading out on our bikes, Lil’ L and I decided to bake some Cinnamon Fruit Loaf and Almond Cookies. 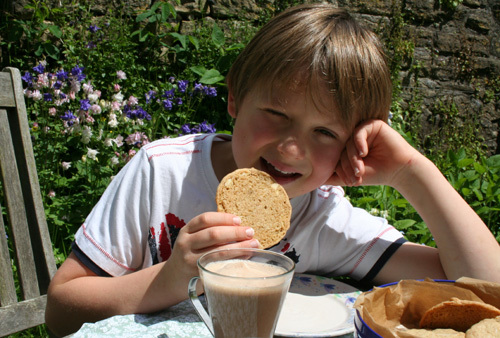 As soon as the cookies were baked, we headed out into the garden to enjoy them along with a cup of raw hot chocolate. 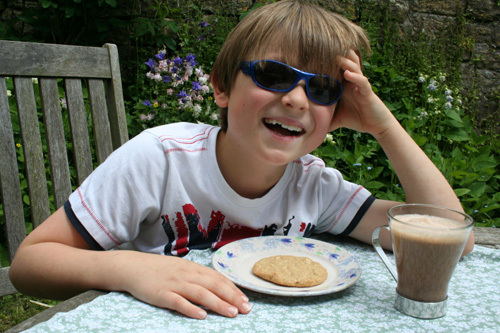 In fact, it was so sunny this morning that we needed to wear sun glasses! The almond cookies were really yummy! Straight from the oven, they were crunchy on the outside with a softer centre. We used chapatti flour which is so fine that you wouldn’t even guess that these cookies were wholegrain! 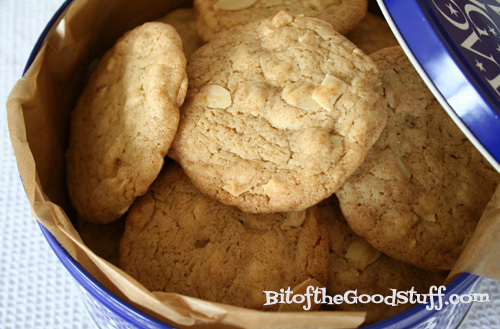 To boost the almond flavour, we added a little almond extract which gave them a hint of marzipan. Next time round, we’re going to toast the almonds first to see if we can boost the almond flavour even more. Preheat the oven to 180C / 350F / Gas 4. Line 2 large baking trays with non stick baking paper. Place the sugar, oil and milk in a large bowl and use a fork to whisk the mixture until it is smooth and caramel-like (about 2 minutes). Mix in the almond and vanilla extracts. Sift the flour, semolina, bicarbonate of soda and salt into the bowl and stir until fully combined. (If your wheat flakes are too big to be sifted, simply whizz them in a grinder, food processor or mini chopper until they are fine). Mix in the flaked almonds. Scoop a rounded tablespoon of dough and place on the prepared baking tray. Press down to flatten the dough slightly. Repeat with the remaining dough, placing the cookies about 5cm / 2 inches apart on the tray (they will spread as they cook). Place in the middle of the oven and bake for 10-15 minutes, until lightly browned round the edges. Remove from the oven and leave for a few minutes before transferring to a cooling rack. When completely cooled, store the cookies in an airtight container. then onto Bath city centre for cappuccinos & smoothies. It was absolutely glorious!